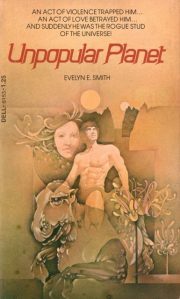 I freely admit that I picked up Evelyn E. Smith’s 1975 Fortean satire Unpopular Planet for a fairly stupid reason: her initials amused me. If only she had had a doctorate! A prolific author, Smith was best known for her crossword puzzles, Gothic romances, and the Miss Melville series (about a middle-aged socialite turned professional assassin). Although some of her work is still in print , this particular novel is not. Having reread it, I think I know why. Nicholas Piggot is both a physical throwback—tall, blond, and sturdy, in a world of short, swarthy nebbishes —and a social maladept. He makes a sketchy living as a disreputable musician catering to the lowest sorts of people. It’s probably for the best that no one know he is haunted by Blue Dragons that only he can see. As it is, only the fact that the extremely well-born Bernardine has set her cap for him has saved him from being classified as unfit to reproduce. Enraged that he has been replaced in Bernardine’s heart, Hubert Carmichael vows revenge. Bad news for poor Nicholas. Hubert is one of the bluest-blooded members of America’s officially classless society; he has the money and influence to make Nicholas’ life as unpleasant as it will be short.